ALS together with autograph mathematical quotation. 2pp. University College London. October 29th, 1850. 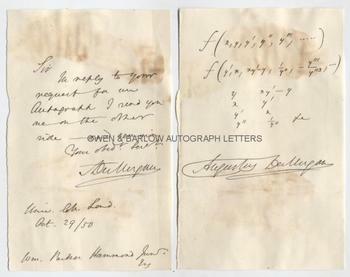 To W[ilia]m Parker Hammond Jun[io]r.
"In reply to your request for an autograph I send you one on the other side and remain your obedient servant" [etc]. On a separate leaf is a 6 line autograph mathematical formula or calculation, signed in full by De Morgan. 8vo. Approx 7 x 4.5 inches. 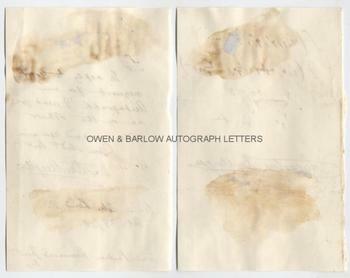 The two pages of the letter have been separated so as to display both in an album, but without any loss to either leaf. There are mounting traces to the blank versos of both and some old staining from the paste that was originally used to affix them in an album. All else very good. Augustus De Morgan was a brilliant mathematician who made important contributions to the study of algebra and logic. He was a friend of Charles Babbage (inventor of the Analytical Machine, forerunner of the modern computer) and tutor to Ada Lovelace (daughter of the poet, Lord Byron, who is credited with writing the first computer programme). Augustus De Morgan coined the terms 'mathematical induction' and 'double-algebra' and formulated De Morgan's Laws, the mathematical rules named after him. The work of De Morgan led to the development of the theory of relations and the rise of modern symbolic or mathematical logic. He introduced and defined the term' mathematical induction' to describe the process that, until then, had been used with little clarity in mathematical proofs. De Morgan was also the first to propose and use the oblique stroke in the printing of fractions. Autograph mathematical quotations of De Morgan are rare, as are documents signed with his full name.